The Kauffman Center for the Performing Arts is the centerpiece of Kansas City's downtown revival. The futuristic 285,000-square-foot, $413 million project links the city's downtown center with its landmark Crossroads Arts and Power & Light Districts, and is home to the Kansas City Symphony, Kansas City Ballet, and the Lyric Opera of Kansas City. The two performance spaces - Muriel Kauffman Theatre and Helzberg Hall - were designed by renowned architect Moshe Safdie. Both were created using ultra-modern, sound-isolating building-within-a-building construction; a foundation, walls, and roof surrounded by fully independent foundation, walls, and roof. 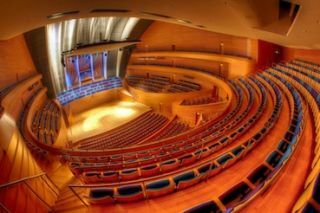 The 1600-seat Helzberg Hall, home to the Kansas City Symphony, offers seating in a semi-circular "vineyard-style" configuration that surrounds more than 270 degrees of the massive 2700-square-foot stage, placing no seat more than 100 feet away. Consultants Engineering Harmonics, whose team included senior consultant Martin Van Dijk, Associate Consultant Roer Gans, and designer Russ Noble, worked with Nagata Acoustics to design the sound system, which was installed by Clair Brothers. With the venue's acoustics primarily designed for symphonic sound, the hall essentially called for dual systems - one for music, the other for voice intelligibility. The main performance system is centered around Renkus-Heinz ST-Series reference point arrays, with left and right clusters of ST4, augmented by ST-2M cabinets. Rear and side fills are amply covered with ST2-R and ST2-MR boxes, while TRX62H compact systems provide over balcony fills. A dozen PNX112 Subswoofers are built into the stage lip, while 72 Iconyx SSL drivers are built into a custom baffle inside the balcony for additional coverage. The voice reinforcement system utilizes three Iconyx IC16-5 digitally steered arrays. The three columns are arranged in a 360-degree configuration, with each column covering a 120-degree pattern. The "voice stick" is concealed in the ceiling, descending from its soffit inside the 100,000-lb acoustical reflector canopy above the stage. The massive, seven-story glass enclosed lobby was also treated to Iconyx systems to help with spoken word intelligibility, with three more Ic16-R arrays concealed behind a metal grille.